Call Active Chem-Dry at (949) 612-7464 for more information about our service compared to steam cleaning and DIY rental machines. It’s important to understand the difference between carpet cleaning choices before you schedule an appointment. Active Chem-Dry offers a much different, better service than steam cleaning or carpet shampooers. There are several factors that separate the Chem-Dry carpet cleaning process from steam cleaning. These factors explain why the Chem-Dry Hot Carbonated Extraction (HCE) service is considered among the best available. The HCE process from Chem-Dry has received the Seal of Approval from The Carpet & Rug Institute. HCE is the drier, cleaner and healthier carpet cleaning choice. Steam cleaning saturates your carpet with an excessive amount of water. It also uses soaps and detergents. When steam cleaning is over the carpet is still wet for 1-2 days. Wet carpet can create a breeding ground for mold, mildew and bacteria. Plus the soapy residue left behind attracts dirt and causes your carpets to get dirty much faster. The Chem-Dry process is different. Instead of saturating your carpets with water, our process employs millions of microscopic bubbles to explode dirt from deep in your carpet fibers. This means we only need to use a fraction of the water that typical steam cleaning uses, almost 80% less in fact. After the carbonation releases and lifts the dirt, our high-powered equipment extracts the dirt and moisture from the carpet. Steam cleaning uses excessive amounts of water that often soaks through to the carpet backing and creates a breeding ground for allergens and contaminants. The Chem-Dry low-moisture process doesn’t carry the same risk and offers a safer and more convenient carpet cleaning solution. 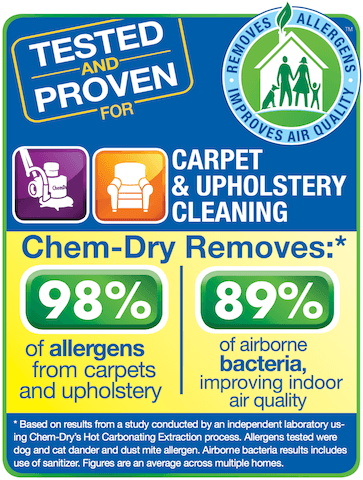 Your carpet dries in 1-2 hours with Chem-Dry. Your carpet dries in 1-2 days with steam cleaners. Most important. Chem-Dry doesn’t leave dirt-attracting residue behind. This means your carpet will stay cleaner longer.